More than 50 families on a Milton Keynes estate built just three years ago could be forced to move out of their flats while major fire safety work is carried out. It is understood the work will involve ripping out internal walls and complete kitchens in the Oakgrove flats. The properties were built by construction giants Crest Nicholson but are owned by Clarion housing association. It is not clear whether the flats were built with structural defects that compromise fire safety, and if so, how they passed statuary building control tests at the time. 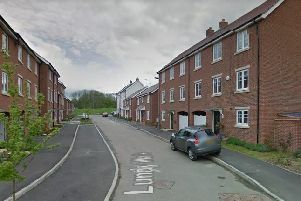 Residents have been told Clarion will be carrying out the building work - but they have not been told where they will be moved to. Ward councillor Catriona Morris is campaigning for residents to be given more information. She and fellow Tory John Bint arranged a meeting for residents with Clarion tomorrow (Thursday) at 2pm at the parish office in Atlas Way. The issues were discovered after Clarion carried out a fire safety investigation following the Grenfell tragedy. A Clarion Housing spokesperson said: “The safety of our residents is our priority and since the Grenfell tragedy last year we have accelerated our programme of fire safety investigations across all our properties. “Following these inspections, we have been carrying out a programme of work to rectify any issues that were identified. As part of this, earlier this month we advised residents at Oakgrove that we will be carrying out repair work in their homes to address an issue with the original installation of some of the internal walls. The flats were completed by Crest Nicholson in 2015 and taken over by Clarion from that date. The four blocks of flats needing work are Ruby House, Morse House, Brooker House and Odyssey House. Crest Nicholson’s PR company has not yet responded to the Citizen’s enquiries.